Scene of boats docked along a river by an unknown German artist. Signed "Th. Muschen" in lower right corner. Back of board has a bear stamp from the manufacturer. Original paper backing has a stamp from a German guilder/framer (PAUL ROUS Vergoldermeister Kaiserslautern * Benzinoring 39). Presented in a gilt wood frame. Oil painting of apple trees in bloom with a lake and mountains in the background. Signed "Plein" lower right. Circa 1940. Displayed in a rustic giltwood frame. 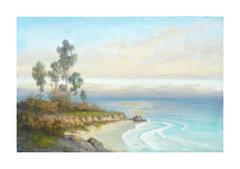 Image, 24"H x 30"L.
Beautiful impressionist seascape of Carmel in the mid century by an unknown California artist Unframed. Artists canvas board. Image 24"H x 36"W. Signed "D R", lower left. An original painting of a beautiful Spanish church with dramatic stormy skies. This piece is signed illegibly lower right and dated 1920. An original American painting of Eucalyptus trees in its original frame. This work is signed illegibly lower right. Impressionist view of a docked boat. Oil on canvas, circa 1940. Unsigned. Displayed in a modernist frame. 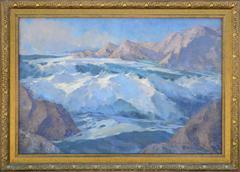 Image size 27&quot;L x 22&quot;H, overall 34&quot;L x 30&quot;H.